Valarie says: When he started the Wedgwood development in the 1940s Albert Balch built very traditional-style houses with early-American historic motifs such as Colonial and Cape Cod. 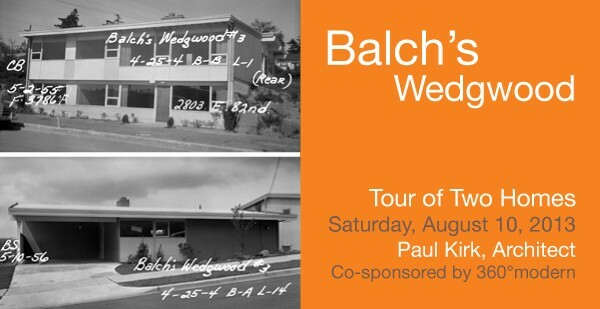 The houses on this tour, built in the 1950s in modern styles, show how Balch kept up with trends and engaged the best architects in Seattle for the design of Wedgwood houses. Docomomo WEWA and 360°modern invite you to a summer tour of two homes designed by Paul Hayden Kirk in Seattle’s Wedgwood neighborhood. The two houses open for view on 28th Ave NE were built for real estate developer Albert Balch, Jr. who was the first to develop residential tracts in Wedgwood and View Ridge. Kirk designed several other homes on the same street and nearby. This is an opportunity to see more modest designs by Kirk as opposed to the custom designed houses we’ve seen on past tours. The event is a self-guided tour. The two houses are within easy walking distance on the same block. Exterior photos only. LOCATION: Go to Docomomo WEWA website for details. DATE: Saturday, August 10, 2013. Houses open to view 2:00 and 5:00 p.m. This entry was posted in Architecture, Balch, Houses and tagged Northwest Modern architecture in Seattle, Paul Hayden Kirk. Bookmark the permalink.